Chronic pain in your upper back may be the result of a disc herniation in your thoracic spine. At Spine Group Beverly Hills, John Regan, MD offers advanced diagnostic testing services to alleviate chronic pain and improve functionality in your middle spine. 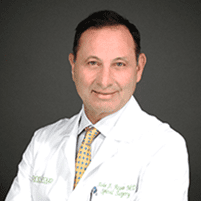 He can provide nonsurgical and surgical treatment options, including an endoscopic thoracic discectomy procedure to end pressure on your spinal nerves and reduce your pain. Learn more about treatment options for thoracic disc herniation by calling either the Beverly Hills or Santa Monica, California, office or booking an appointment online. A thoracic disc herniation occurs when the gel-like substance in the inner portion of the disc pushes through the outside. This type of herniation can occur in the discs of your middle back and can cause persistent back pain due to pressure on surrounding nerves or the spinal cord. With a herniated thoracic disc, you may also experience numbness or pain that radiates down your arms. What causes thoracic disc herniation? A herniated thoracic disc can occur due to an acute injury to your upper spine or because of a degenerative disease that breaks down the structure of your spinal discs. You may also develop chronic back pain as you get older and your thoracic discs start wearing out. How do you diagnose thoracic disc herniation? Dr. Regan reviews your medical history and performs a physical exam, checking for locations of tenderness or pain. He may request additional imaging tests, such as an MRI or CT scan, to better understand the cause of your pain and rule out other medical conditions. Once Dr. Regan confirms a disc herniation, he designs a customized treatment plan that addresses your pain and improves your spine functionality. What treatments are available for thoracic disc herniation? Initially, Dr. Regan may recommend nonsurgical treatment options to help reduce your pain and improve functionality in your middle back. Treatments may include over-the-counter or prescription medications to alleviate pain. Dr. Regan may also recommend physical therapy to improve muscle strength to better support your spine. If nonsurgical treatments aren’t effective in managing chronic pain that interferes with your job or your personal life, Dr. Regan may recommend surgery. An endoscopic thoracic discectomy is an innovative surgical technique that allows Dr. Regan to remove the damaged disc to stop the pressure on your spinal cord or nerves. Once the disc is out, Dr. Regan inserts an artificial replacement disc to stabilize your spine. Dr. Regan accesses the damaged disc using a minimally invasive endoscopy procedure. This technique uses a specialized endoscope device Dr. Regan inserts into a small incision near the herniated disc. Through the endoscope, he can see your disc and can then perform the disc removal using small surgical instruments. The benefit of an endoscopic thoracic discectomy is that Dr. Regan can remove the damaged disc without causing extensive trauma to your body. You can expect to heal faster following this type of minimally invasive surgery. Schedule a consultation with Dr. Regan online or by phone to learn more.